Complete your Whistler Junior Furniture Collection with the Canwood Whistler Junior Slide Out Desk. Designed to pair with the Whistler Junior Loft Bed, the Slide Out Desk is a great space for your child to do arts and crafts or complete their homework. The Slide Out Desk is ideal for smaller bedrooms as it conveniently slides underneath the Whistler Junior Loft when not in use and has two spacious shelves for extra storage. Constructed from high quality solid pine wood and composites, the Slide Out Desk meets all current safety standards. Complete your bedroom décor and purchase other matching Whistler Junior Furniture items such as the Canwood Whistler Junior 3 Drawer Chest, the Canwood Whistler Junior Bookcase and the Canwood Whistler Junior 2 Door Cabinet. SPACE SAVER: The Whistler Junior Slide Out Desk helps you create more usable space in your toddler, kids, or teen bedroom. Combined with the rest of the Whistler Junior Furniture Collection, it lets you keep your kids space functional and uncluttered. 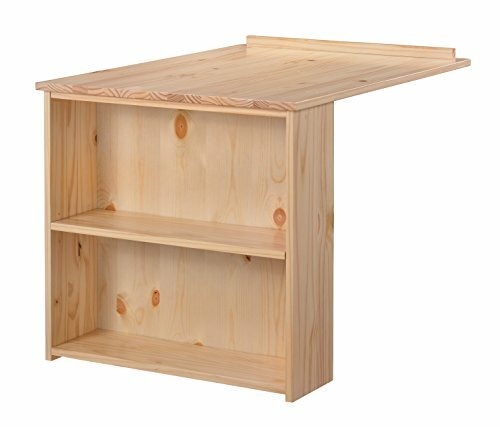 QUALITY CONSTRUCTION: Made with high-quality, solid pine wood & composites, the Whistler Junior Slide Out Desk is an ideal addition to your child's room. Sturdy enough to hold homework, models or an army of plastic dinosaurs, it's the perfect kids' desk. FULL SET: Our Junior Furniture Collection has everything you need for a clutter-free, stylish kid's or teen's room. The loft bed, 3-drawer chest, junior bookshelf & 2-door cabinet fit together easily, providing ample storage for toys, books, games & more. If you have any questions about this product by Canwood, contact us by completing and submitting the form below. If you are looking for a specif part number, please include it with your message.